Pin It Some exciting news showed up in my mailbox today and I just had to share it with you. My stepson, Andy, has been studying enology for the past six years or so and working with many different wineries on several continents. 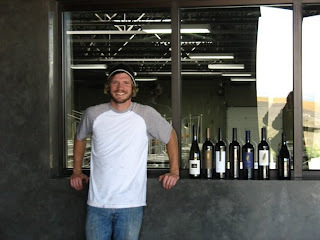 From 2007- 2008, Andy worked with the esteemed private cellar Long Shadow Wineries in Walla Walla, Washington. While at Long Shadow and under the direction of winemaker Armin Diel, Andy produced several wines including the 2008 Poet's Leap Riesling. Now for the exciting news ... ﻿Last week, President Obama hosted China's President Hu Jintao at the White House State dinner and served Long Shadow's 2008 Poet's Leap Botrytis Riesling! At the request of the Chinese Delegation, the White House arranged a "quintessentially American" evening, complete with menu, decor and entertainment that reflected some of the nation's most recognizable offerings. The 2008 Poet's Leap Botrytis Riesling was one of only three wines poured that evening, and was served for dessert with old fashioned apple pie and vanilla ice cream. Just last month, I served this same wine with Christmas Eve dinner - Paella to celebrate the Feast of the Seven Fishes. It's truly a delicious wine - one of my favorites. The winemaker's tasting notes: Freshly peeled grapefruit, an appealing minerality, and a hint of ripe pear define the 2008 Poet’s Leap Riesling. Bright acidity gives the wine its vibrancy and a clean, underlying touch of sweetness contributes to a lengthy finish. 2008 Poet's Leap served for the Feast of the Seven Fishes. The bottle had been signed by Andy (wine-producer). Andy enjoying a fresh tasting directly from the barrel. A private tour and lesson on the art of wine-making. Who knew a couple of years ago that these grapes would be served at the White House?! Andy and his Dad on the first day of his enology studies. If you haven't discovered the Walla Walla wine country of Washington State, I recommend you plan a visit this summer. It's a lovely little town with fabulous wineries. You will not be disappointed.